Around this time last year, I’d finally reached a breaking point and decided to quit my job because I was imploding. 2013 was in many ways a transitional year, but I was terribly unhappy. I also didn’t manage to complete a novel draft the entire year, for the first time since I started writing seriously in college. My life wasn’t working, so I took some drastic steps. This year, I wanted to restructure my life to support my writing, rather than trying to fit my writing in around my life; make writing the priority; learn how to write consistently instead of in binges because sanity matters; finish projects. It’s taken me months to sort out how this balance works for me, the dance between writing much and consistently without overwhelming myself, between also having a social life (leaving my apartment and talking to friends is beneficial to my emotional well-being! madness, I know) and working part-time and going to cons and finding myself in a committed relationship for the first time in my life (it’s been 9 months now, which also seems like madness). – In the last year I’ve completed the first drafts of three novels and completed edits on two novels (only one novel is in both of those categories). – I’ve written more than 250,000 words of fiction for novel drafts — that is, not counting edits, background work, or submission packets (nor blogs, reviews, beta feedback, etc.). That’s more productivity on writing than I’ve ever managed before, and I’m getting faster. The better I understand my process, the better I can structure my life to maximize my time. I’m not done settling into this new balance. My work and living situations are both going to have to change, for instance, but now I know what I need from them both. It’s a work in progress, but it is progress. It’s so much progress. Because what the statistics don’t say (unless you’re a writer and understand that how you feel about the novel affects your mood for Everything Else), is that I’m happy. That’s the most important change. Happiness for me is tied inextricably to my writing, but there are a lot of other pieces, too. And it’s taken months to get to a place where I don’t feel like I’m having to claw my way out of a hole every day, but I’m there. Or getting there, closely enough that I can breathe. Last year, I talked about figuring out how to fly, every day. In the figurative sense, I’m learning how to flap in the wind. In the literal sense, I’ve decided to make flying/adventuring a yearly pre-birthday tradition: something I do on my own, for myself; something I’ve always wanted to do that I’m now going to actually do. Last year, it was skydiving, jumping out into the sky and falling. This year, it’s flying trapeze — something that’s always fascinated me (hanging upside-down while flying through the air, why wouldn’t I want to do this??). The hardest part was climbing up the ladder, but once I was on the trapeze, well, flipping upside-down has always been easy for me. Some stutters, sure, but I kept flying, or I got back up and flew again. 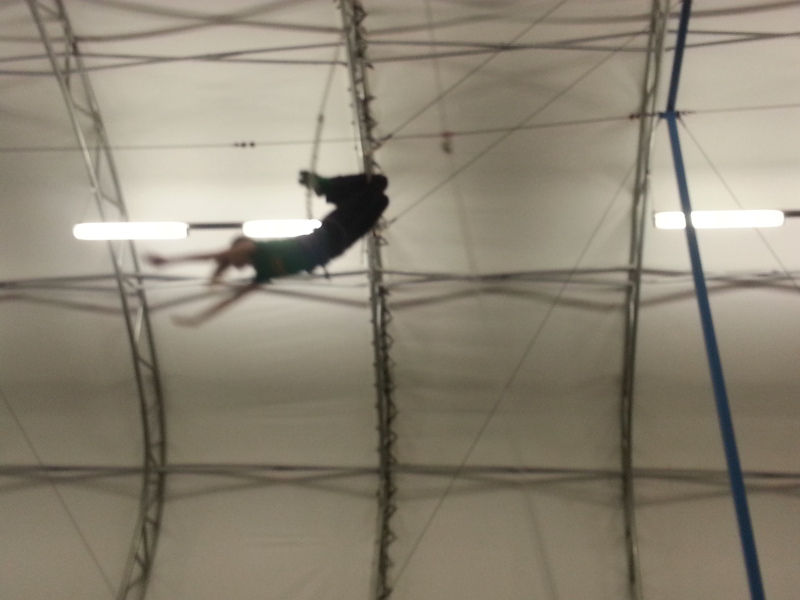 And I also learned that it is very easy to do trapeze here, so I could even make it a habit, a sustainable hobby. Last year I jumped; this year I learned how to fly. Maybe next year I’ll soar.